If there are pests in your home or business right now, it’s highly unlikely they’ll go away on their own. You’ll need to invest in pest control in Hopedale, MA to get rid of them and avoid the risks that come along with insects and rodents. D&T Pest and Termite Control Inc. is the pest control company in Hopedale you can trust to tackle your pest problem with a vengeance. Home and business owners have been turning to the fully licensed and insured company for bee removal, mice treatment, termite control, bat removal, ant control, bedbug treatment, squirrel removal, and more for over 20 years. Since being founded in 1997, D&T Pest and Termite Control Inc. has worked closely with thousands of home and business owners while providing pest control in Hopedale, MA. From small homes to large buildings, the specialists at D&T Pest and Termite Control Inc. have extensive experience when it comes to pest control in Hopedale. They can figure out where pests are in a home or business, come up with the best plan of attack to eliminate them, and keep you and your family or employees safe in the process. Don’t let a pest problem spiral out of control simply because you don’t act quickly enough. With pest control in Hopedale, MA, you can get rid of termites, ants, mice, rats, bedbugs, and so many other types of pests in a matter of just days so you don’t have to worry about dealing with them. The family owned and operated D&T Pest and Termite Control Inc. will make sure of it by setting you up with superior ant control, tick treatment, bee removal, squirrel removal, and termite control services. 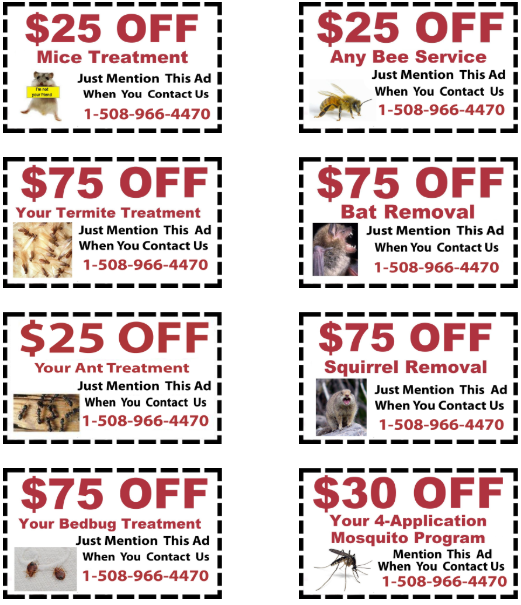 Obtain pest control in Hopedale, MA by contacting D&T Pest and Termite Control Inc. at 508-966-4470.